When Amy’s mum dies, the last thing she expects is to be kicked off her dad’s music tour all the way to her Aunt Lou in a depressing hole of a seaside town. But it’s okay, Amy learned how to cope with the best, and soon finds a hard drinking, party loving crowd to help ease the pain. The only solace is her music class, but even there she can’t seem to keep it together, sabotaging her grade and her one chance at a meaningful relationship. It takes a hard truth from her only friend before Amy realises that she has to come to terms with her past, before she destroys her future. Almost eighteen year old Amy has just moved to the country, despite her protesting, and never plans to speak to her father again. Since her mother died four months ago, Amy has been on the road, touring venues and stage shows with her Father, well known rocker Stevie D. But Amy's father can't give her the stable life she needs and sends her to finish her schooling with Aunt Lou, hoping that clean country living will straighten out her alcohol issues. Feeling abandoned, Amy Detrinella starts her new life at Cherrybrook High, having been homeschooled for the past three years. Wearing a hideous tartan uniform and feeling overwhelmed, she stumbles upon the alluring Luke and is instantly hooked. Luke is polite and absolutely gorgeous... He's also taken, as Amy is introduced to his sneering and territorial girlfriend, Coral. The awkward hallway exchange, catches the eye of Lily, cool girl and anti Coral enthusiast and what could possibly be the first friend Amy has had in years. But when Lily drags Amy along to a Friday night party, her world is about to become far more complicated. Accosted by three teens, Amy is saved from a potential sexual assault by Luke. Luke is adamant that the boys were only playing and that the police wouldn't believe her once they smelt the alcohol on her breath, that it would be best if she keep the attack a secret and Amy is conflicted. The not so single Luke claims that he feels a connection with Amy, flirting secretly within the Cherrybrook halls, and the simple heated touches in their shared music class, which hasn't gone unnoticed by Nick. Nick is a tattooed rock god, repeating his final year of school, plays in a band and bartends part time. He's everything that Amy isn't looking for, except single. The life of a musician only reminds Amy of her father, and she has no desire to be an afterthought to anyone's music, following in the footsteps of her parents. Amy continues to drown herself in alcohol, detach herself from new friend Lily and and ostracise herself from her Aunt, but when Luke admits that he is going to end his relationship with Coral, it's just the push that Amy wanted to take things further. What ensues is a web of lies, deceit and cruel taunts as Amy's life is yet again turned upside down. Sometimes you can't judge a book by it's cover, and Amy is about to discover how true that is. 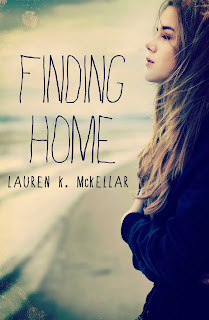 Finding Home is a novella told from Amy's point of view, daughter of an aging well known rocker. Amy is ridiculously naive, seemingly only picking up a love of alcohol from being on tour. Her father wants a stable environment for Amy, where she can stop binge drinking and interact with teens her own age, but Amy seems to involve herself in situations that could only stand to damage her further. We're offered insights into how Amy's love of binge drinking began, but the only explanation of her chasing Luke, who's already in a relationship, is purely her own stupidity. It was engaging but touched on serious issues facing teens today, alcoholism, drug use, sexual assault and the story of a girl trying to find her own feet again. Thank you to Netgalley and Harlequin Australia for the opportunity to read and review. Hmmm I didn't know binge drinking was a big part of it, but I like that it's a short novella. Thanks for sharing Kelly, I have this one to read too. Hey Jeann, thanks for stopping by. Yeah, it plays a big part in the storyline, as it's her means of coping. It's sad how her binge drinking comes about though, it made me see the main character Amy in a different light. This sounds like an amazing story. Lovely to see you again Carol. It certainly is, it's definitely one that you can read within one sitting, but really packs a punch.